En-Voice MKII, Channel Strip from Mindprint. Mindprint has decided to celebrate their 10th anniversary with a special Digital Edition of their Tube Recording Preamp EN-VOICE MK II. 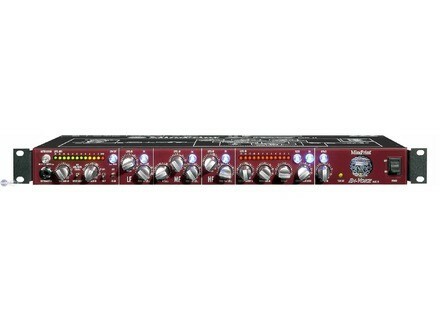 This preamp is now available as limited Digital Edition with integrated USB audio interface. The company assures this bundle saves the customers’ money twofold since on the one hand, it’s unnecessary to purchase an additional sound card and on the other, the suggested retail price is significantly lower than the individual prices of the components EN-VOICE MK II and DI-MOD USB. The EN-VOICE MKII "Digital Edition" is shipping with drivers for Windows XP and Mac OSX. No pricing info yet. [Musikmesse] Genelec 8020B Genelec has replaced its 8020A active monitor with the new 8020B. [Musikmesse] Crest Audio CV-20 Crest Audio has announced that the CV 20 is now shipping into Europe and the Middle East. [Musikmesse] Crest Audio New X-Series At Prolight & Sound/Musikmesse 2009 Crest Audio presented the second generation of the X Series rack mixers, introducing four new models.